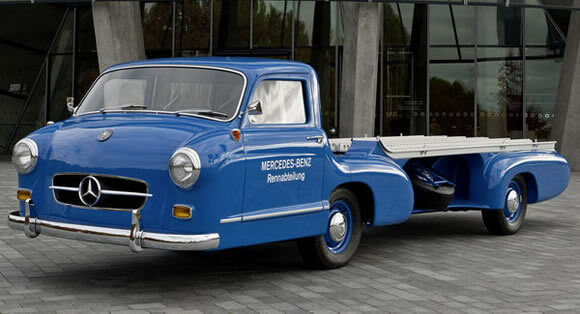 Back onto the subject of great times in motor racing history: the Blue Wonder was the car carrier built for the Mercedes F1 team in the mid 50's. It served the team for ten years and was billed as the 'fastest racing car transporter in the world'. It has the direct injected, three-liter inline-six from the 1955 300SL Gullwing, awesome. The original was scrapped in 1967 but lucky for us Mercedes Benz have built one from their archives. Mercedes have a history of cool transporters but this is definitely the coolest and brings back memories of the Thunderbirds and Captain Scarlet and the Mysterons. Check out more photos of it here.